A Canadian executive businesswoman moves to Rome, for amore & luce! 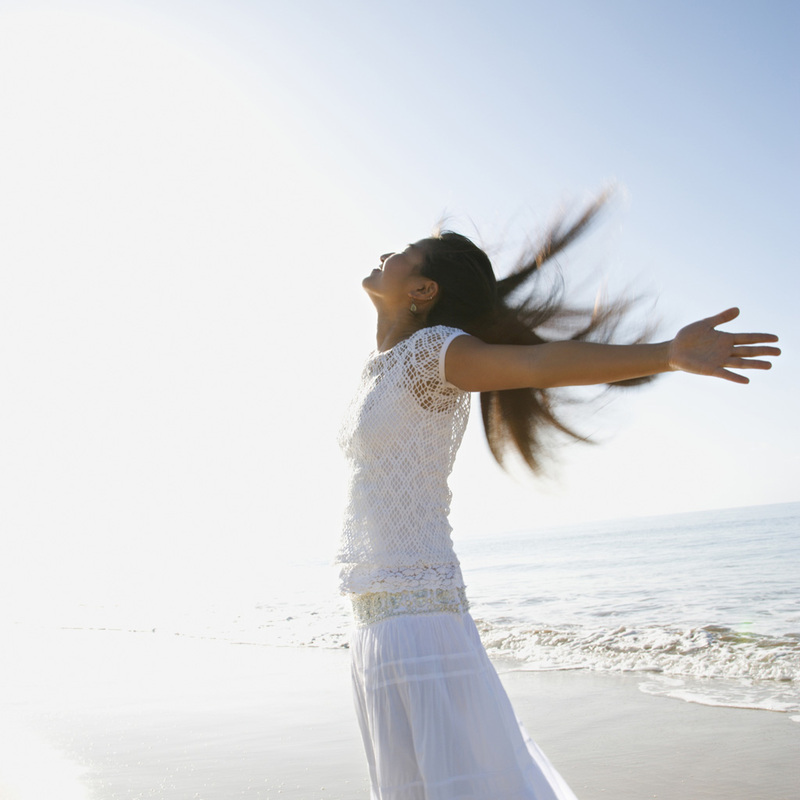 It’s always inspiring to meet someone who is doing good while they are doing well. 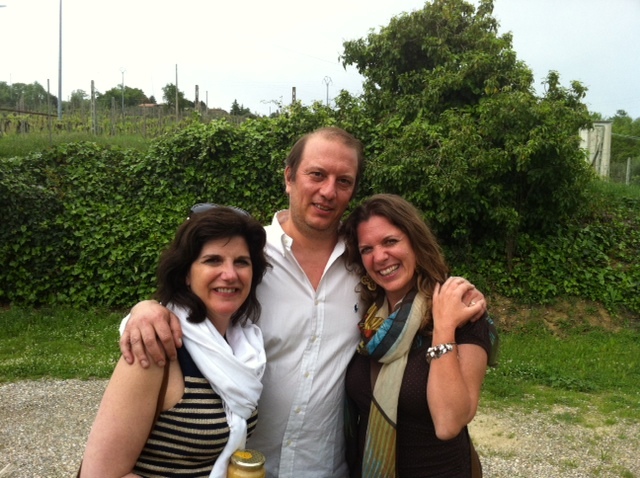 Such is the case of William Savian in the Veneto region of northern Italy – and his organic, solar powered – and delicious – wines! 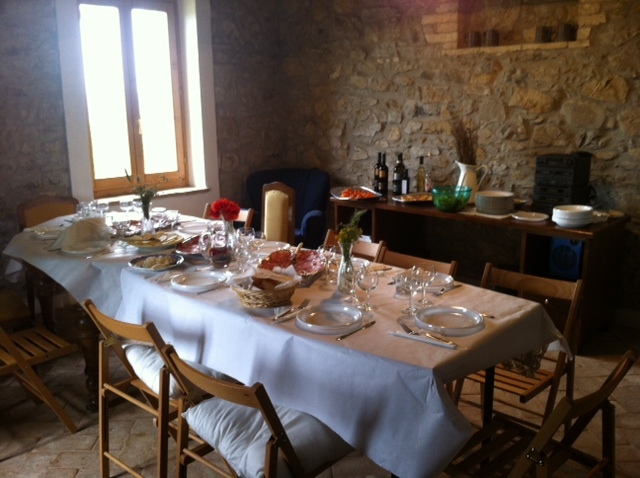 Traditional “azienda vinicola” – except for the solar panels on the roof! The Savian vineyard dates back to 1925, when William’s grandfather’s small plot of land produced wine for friends & Family. Flash forward to 1990 when William’s father Arnaldo decided to expand and commercialize the vineyard. Using conventional farming techniques he did indeed expand the production but over time became disturbed. After 3 years he realized that he could no longer hear the hum of crickets and the chirps of frogs at night – the pesticides and herbicides had killed them all off. Whatever they were doing to the land, was destroying the local wildlife. And how could an agricultural business survive the destruction of its environment? 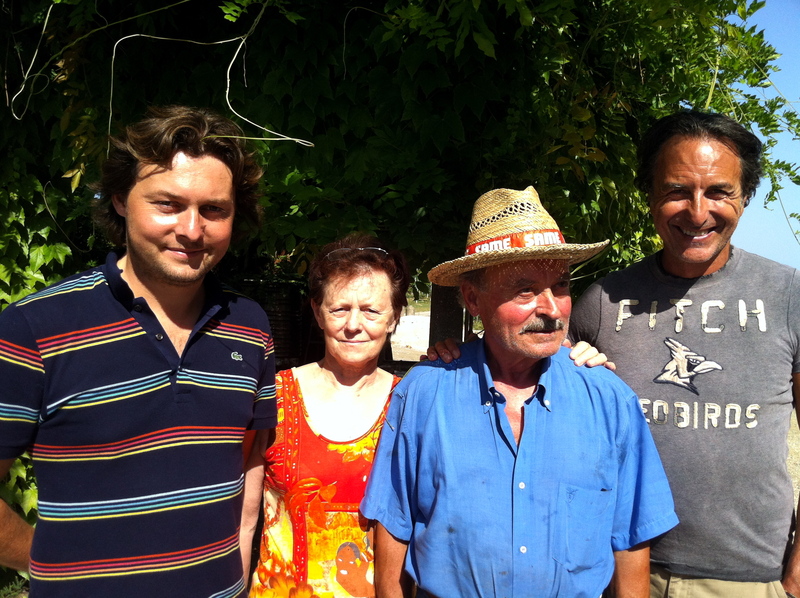 So in 1993 Arnaldo became a pioneer in transforming his wine production to be completely organic (certified by ICEA, Delinat and NOP). And instead of the business suffering as a result, today it thrives – in Italy and around the world. Actually, in Italy most consumers really only care that his wines (including standards like Merlot & Chardonnay, sulfite-free wines, as well as wonderful regional specialties like Lison Classico and Refosco da Peduncolo Rosso) are of the highest quality. But in other countries, starting from Germany, buyers took a second look at Savian’s wines in a saturated market because they are organic. 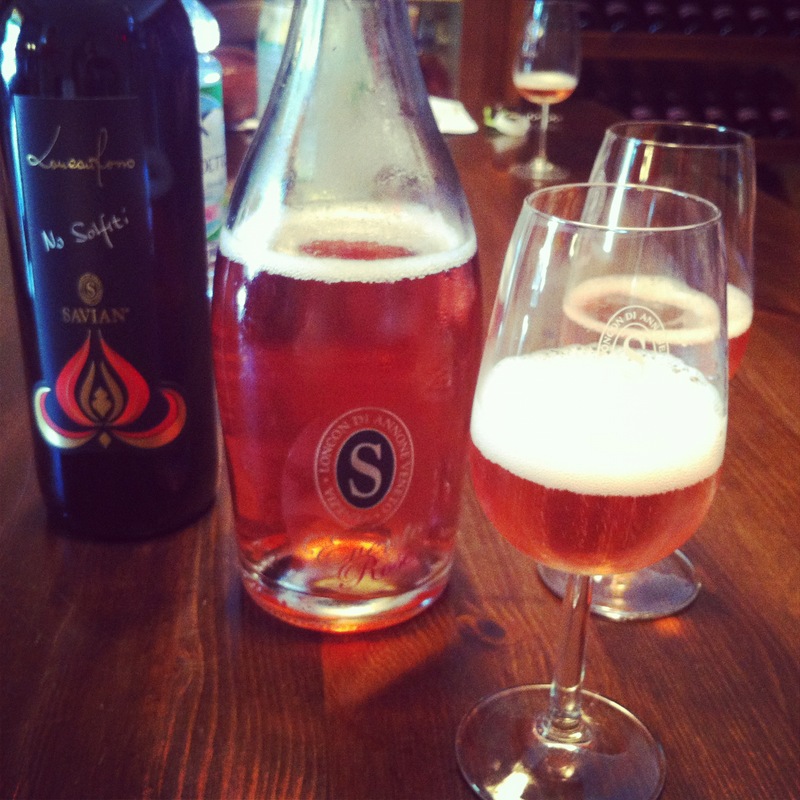 One of Savian’s outstanding organic proseccos made in the Charmat method. And over time, William and his father decided to go a step further than organic and make the vineyard solar-powered. 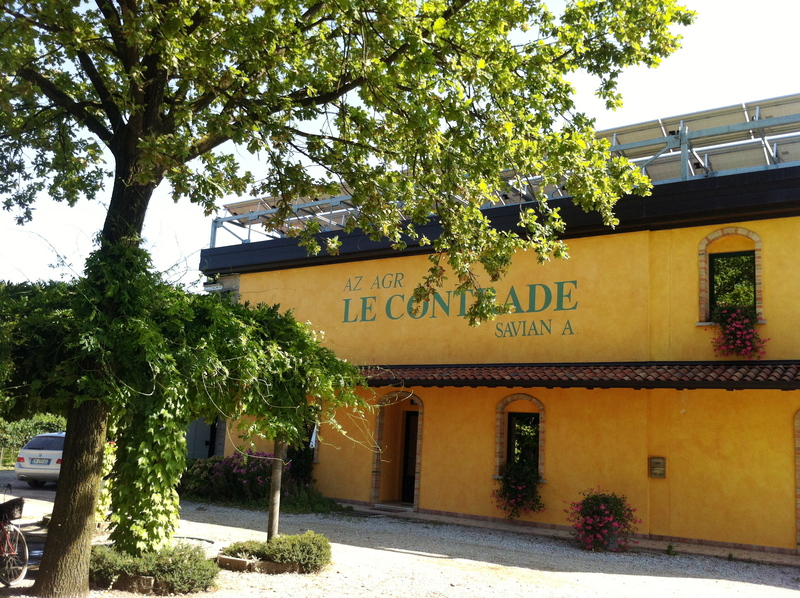 With the amount of sun shining in Italy, this was a great choice for Savian wines, and the savings in their consumption of ever more expensive power makes this also a savvy business move too. 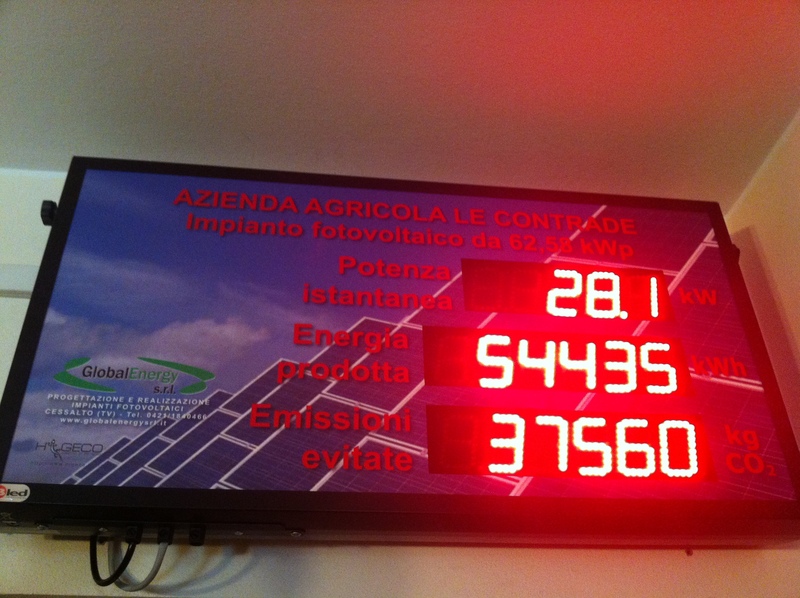 This central console shows the solar power production and usage of the vineyard. Today’s Savian’s wines are sold all around the world, including Germany, Canada and Brazil and have won awards and fans in a multitude of categories. But one of the greatest indicators of success was for William seeing his kids be able to play around the vineyard, and to not worry about the health hazards of pesticides and chemicals. We even saw a snake in a ditch on the property while we were there. In Ontario, Savian’s extraordinary wines can be ordered through Le Caviste or you can contact Alessando Dialuce for worldwide availability. Enrico is a man with a mission. Years ago he purchased 22 acres of prime vineyard, just outside the ancient city of Orvieto, Umbria; overlooking Lake Corbara (about an hour north of Rome). With Freddano‘s elevation, softly sloping incline, fertile earth and sunny exposure, it was the ideal place for producing not just wine, but magnificent wine. But he had a problem. In the somewhat limited perspective of wine drinkers around the world, Orvieto doesn’t signify magnificent wines. Sure, everyone knows Tuscany = great wines, a mere 30 kilometers away. The fame of the Tuscan region means even that its less stellar wines command the highest demand and good wines can draw impressive prices. However, if a wine drinker in America or Canada or The UK deigns to try an Orvietan wine, they usually expect it to just be cheap. So Enrico and and his oeneologist Michel had an important decision to make. They could take their lovely vineyard, cut corners, crowd the grapes, spray the land with chemicals and create cheap, non descript plonk; or, truly honor the potential of the land and create a magnificent wine to convince the world that Orvieto wines are contenders. Starting our visit standing in the vineyard, Enrico explained that it’s simply not possible for all vineyards to be organic. If the terrain lacks wind, is situated at a low altitude, or otherwise has damp conditions, it’s difficult to avoid mold and rot with anything but chemicals. But here at Freddano, the conditions are perfect for sustaining organic growth. What can possibly taste better than wine sipped while standing in the soil of origin poured by its creators? 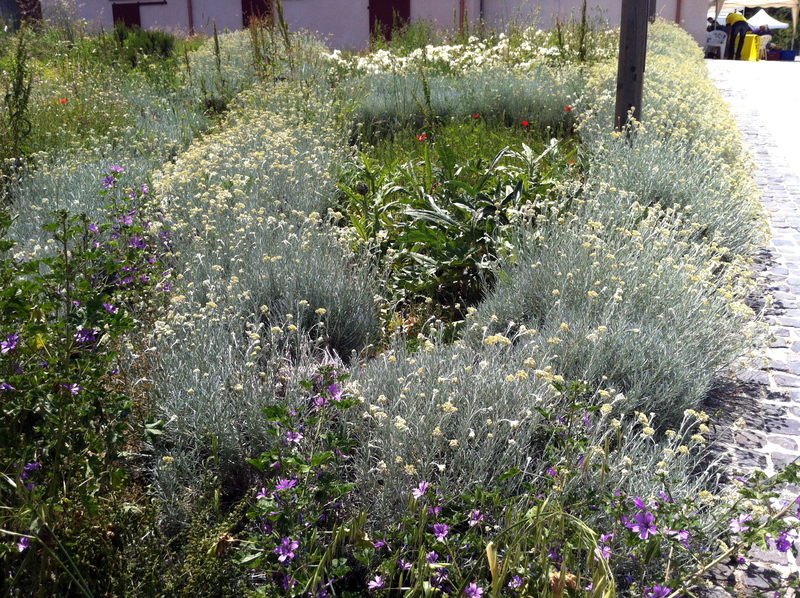 We sipped glasses of VIgna del Sole (“vine of the sun”) standing between rows of grapes; admiring the wildflowers growing at the base of the vines. All maintenance of the vineyard is done by hand, from the pruning of the vines to the cutting of the grass. We could imagine the wildflowers imparting a delicate hint to this delightful white. And of course the ubiquitous rose bushes placed at the end of each row, the “canary in the mine.” roses are even more susceptible to diseases that affect the grapes. So by monitoring the health of the roses, a wine makers can monitor the health of their vines before a problem takes hold. We moved onto the bottling facility where Enrico explained how not only the their agricultural production is organic, but also their fermentation process. This means there are no additives, and most importantly no flavorings added to the wines at any point. Again, more spectacular wine was poured, this time right from the casks, as we tried a grand, unnamed white which will be released in only limited quantities in magnum bottles – this was a true celebration wine! We bandied about inspired names, our enthusiasm whetted by our liquid creativity. Freddano’s wines blend familiar with new – blending grapes you know, with ones you’ve never heard of – like Trebbiano & Grechetto with Chardonnay & Sangiovese – and modernizing ancient growing and processing techniques to achieve organic status. And constantly there is strong appreciation for the sense of place. We are proud to make and drink Orvietan wines! Right down to the bottles – which designs feature tiles from the stunning duomo (cathedral) in nearby Orvieto. 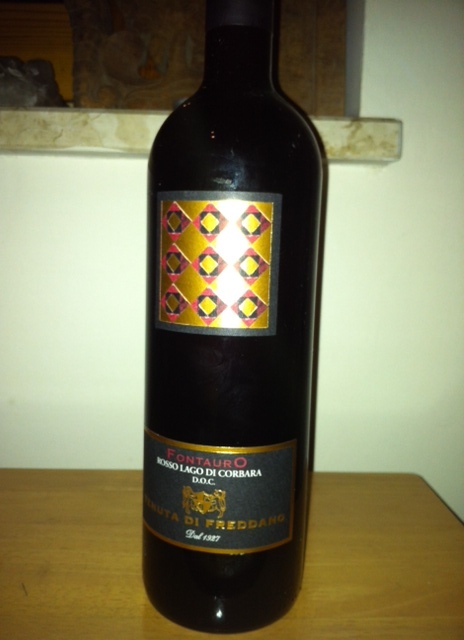 Freddano is represented by Dialuce Wines in Canada and internationally. Please contact Alex Dialuce to order. One of the most pleasurable ways to develop an intimate relationship with a place is to explore a farmer’s market and meet the people who grow our nourishment with their own hands. So imagine my joy when I stumbled across this hidden & unique gem in the northern outskirts of Rome as I was cycling in Parco Regionale Urbano di Aguzzano. It had all the features of the most innovative farmer’s markets. Indigenous wildflower garden, check. Solar panels, check. Wonderful local produce and products. Dogs and bikes. Check, check and check. 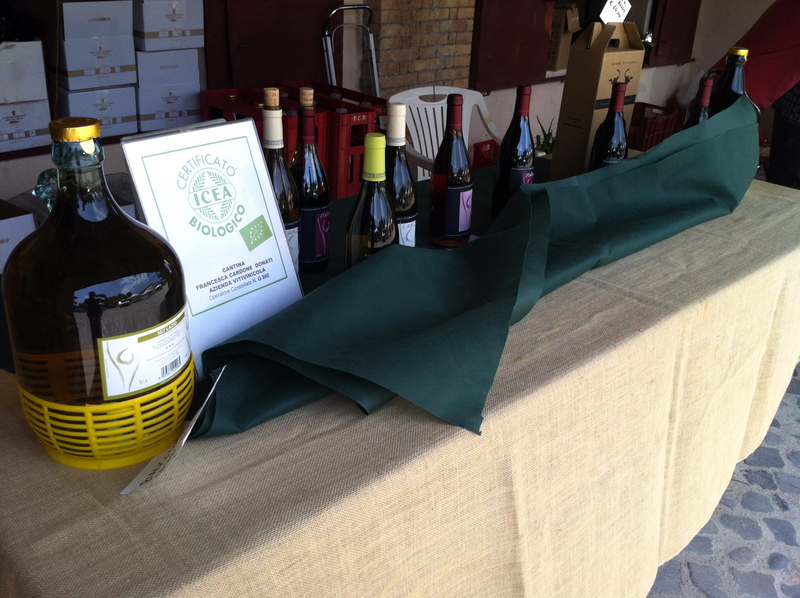 And something you don’t get to see at farmer’s markets in Canada – local, organic wine! 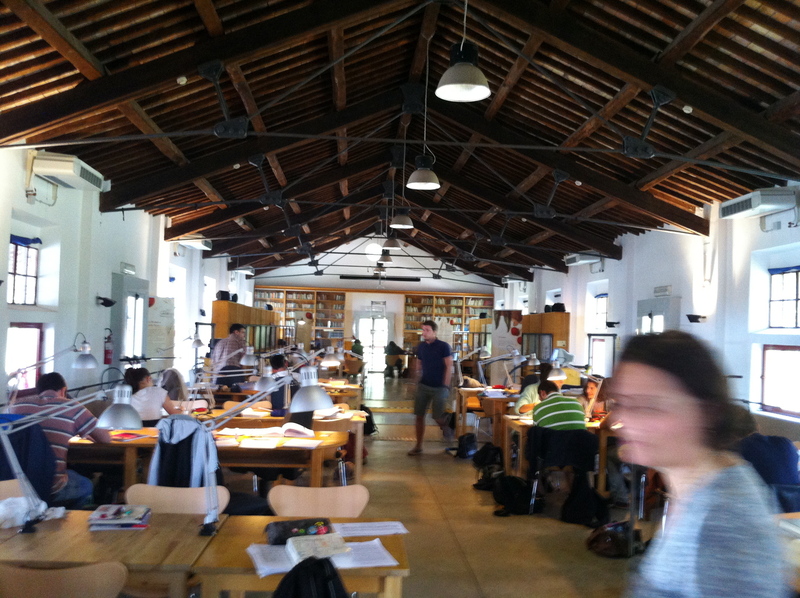 But there’s even more to this bucolic oasis on the outskirts of Rome, which to my surprise was mainly populated by students. 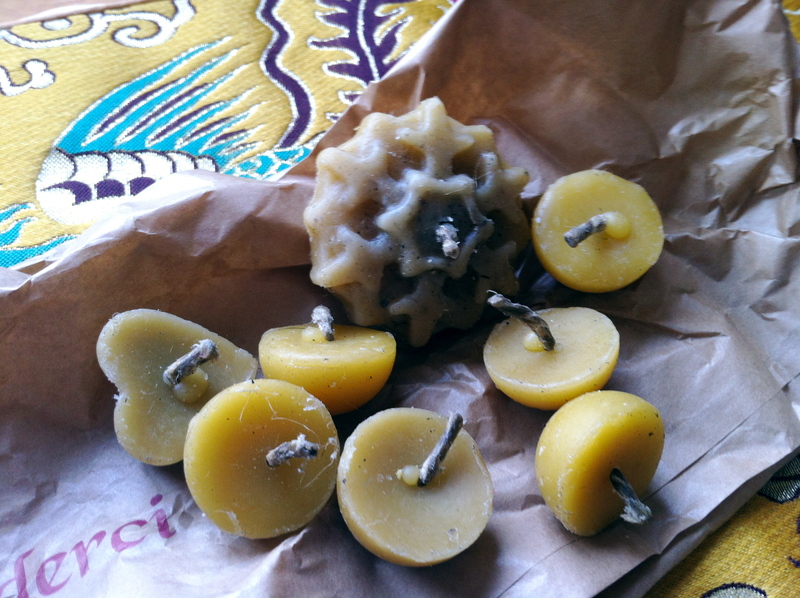 I stopped to talk with Lucia, a friendly vendor selling wonderful local honey and whimsical beeswax candles scented with, of course, 100% organic essential oils. Originally from Romania, she now shares her talents and passion for natural health and wellness with the lucky residents of Rome. Lucia graciously told me the history of this unique place. It used to be a farm over a hundred years ago, and the building that dominates the site still features the feeding troughs for cattle. Over time, the farm was abandoned and became the haunt of rebellious teenagers and outcasts. Bad things happened here, Lucia remarked darkly. But eventually the mayor of Rome stepped in and injected new life, creating Il Centro di Cultura Ecologica (the Centre of Ecological Culture). The mission? To “achieve a high level cultural center dedicated to issues relevant to environment and ecological culture,” engaging the local community, educators, farmers, artists and environmentalists. The barn was transformed into a library filled with donated books. Its restored, bright interior was full of students on this Saturday, dedicating their energy to the study of sustainability & ecology. All these Italian students learning how to create a sustainable future. Cool. It’s easy to get discouraged sometimes pondering the local attitude toward the environment in Rome. That a place like this exists in Rome makes me happy and gives me hope; especially as I contemplate my little bounty of beeswax candles. 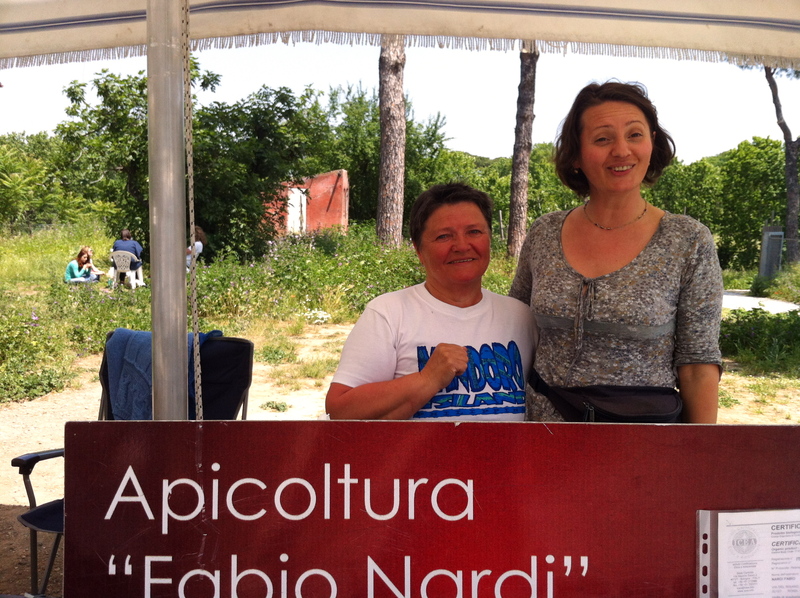 The organic farmer’s market (il MercatoBIO di Aguzzano) runs every 3rd Saturday of the month. It’s probably a little out of your way, but bring your bike or picnic blanket and make a day of enjoy this gorgeous environment. Just follow this path between the pines! Or, bring your bike on the Metro B to the Rebibbia station and find Via Fermo Corni. 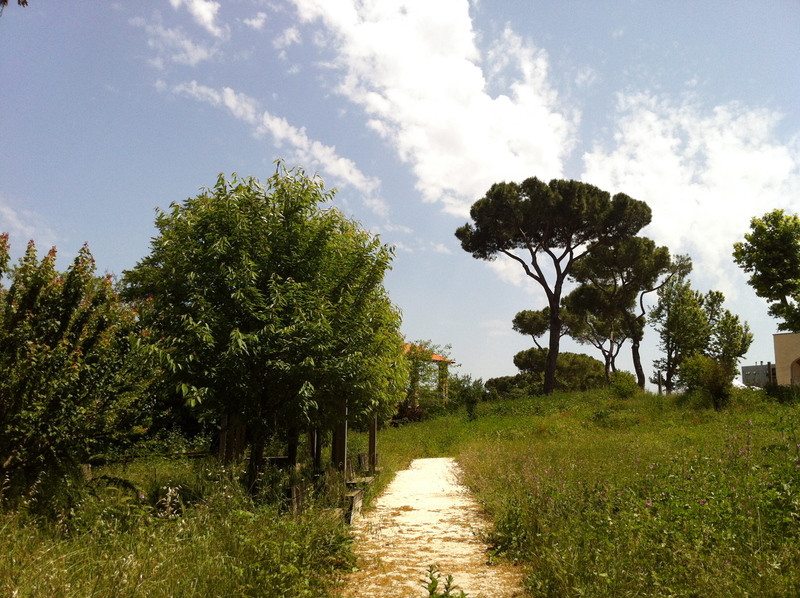 How to get to MercatoBIO di Aguzzano (the best way): turn left a the lotus pond, head up the hill and turn right at the umbrella pine. 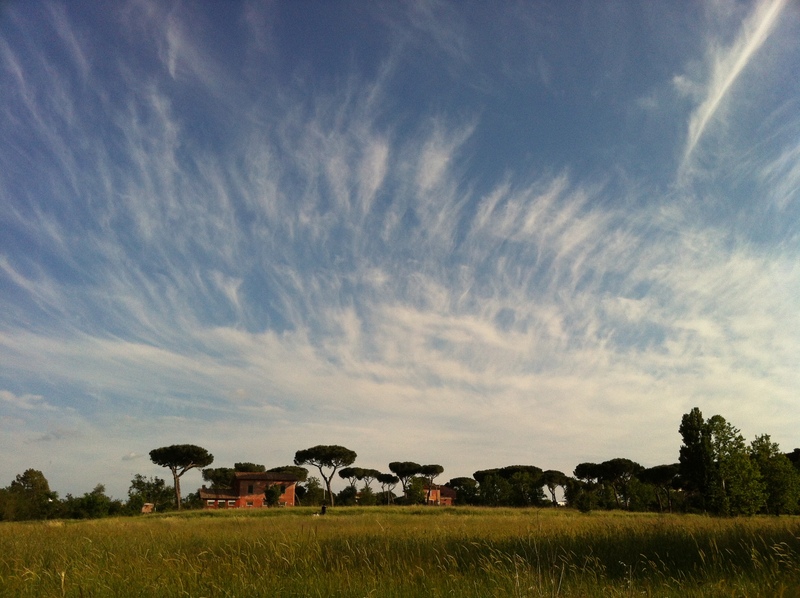 Click to subscribe to Dolce Carla and receive updates from Roma!